If you love all of our products, then don't miss out on this bargain. We have our combo on special, so you save $10.00 off of our regular price (reg. $90.00). You get it all for $80! 1. One 8 oz. bottle of our most popular and multi-purpose "All Natural Liniment" (about a 6 mo. Supply). 2. One 4 oz. jar of "Bone Magic" which is used for chronic pain involving inflammation and/ or damaged tissues. 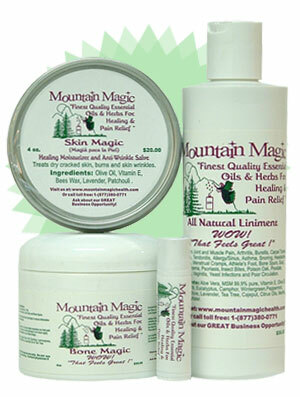 Always best used with "Liniment" applied on top of the "Bone Magic" application. 3. One 4 oz. tin of "Skin Magic" for dry, cracked skin. This is very concentrated & lasts about 1 year! 4. One Tube of "Lip Magic" for chapped lips, cold sores, and fever blisters. Amazing product. My husband has chronic pain from back breakage. He has used Tiger Balm (some relief) and Horse Liniment (some relief); now using Mountain Magic and gets COMPLETE RELIEF. I use it on my legs for circulation. Legs feel great! My sister had pancreatic cancer and died recently. She had us rub this on her to relieve the pain in her bones. It helped. Thank you for taking the time to create an amazing product!